Every year, on the last Tuesday in January, people flock to the Shetland Islands to witness what has been described as one of the top 10 winter festivals in the world. It’s getting bigger every year, helped by the coverage it’s starting to get on the BBC – and not just in the local news “And Finally…” sections. 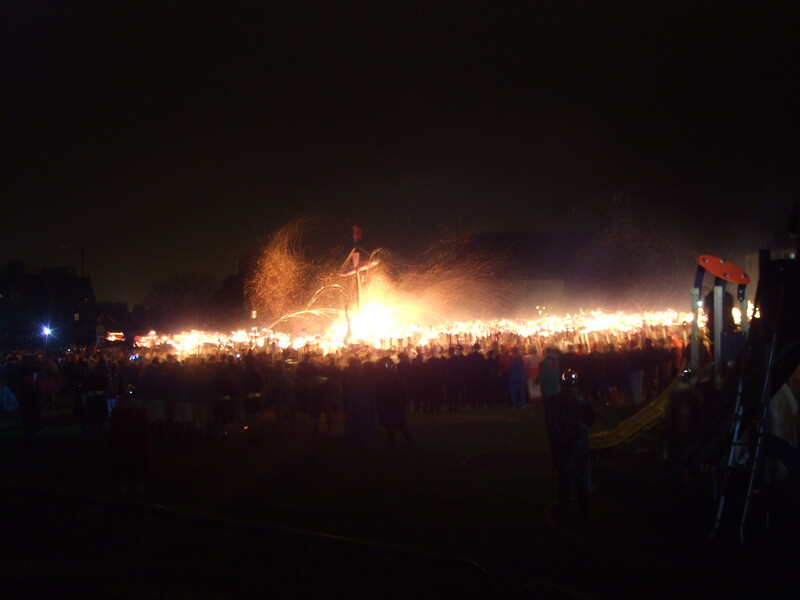 Up Helly A’ (or Aa, depending on who you talk to) is a grand old (Victorian) Viking tradition, created by the Temperance League, that replaced the massively more dangerous tradition of rolling lit barrels of tar through the streets in the 1880s. For a far fuller history, consult Wikipedia. I first saw this madness in 2003 and have seen it, or it’s effects, yearly since. 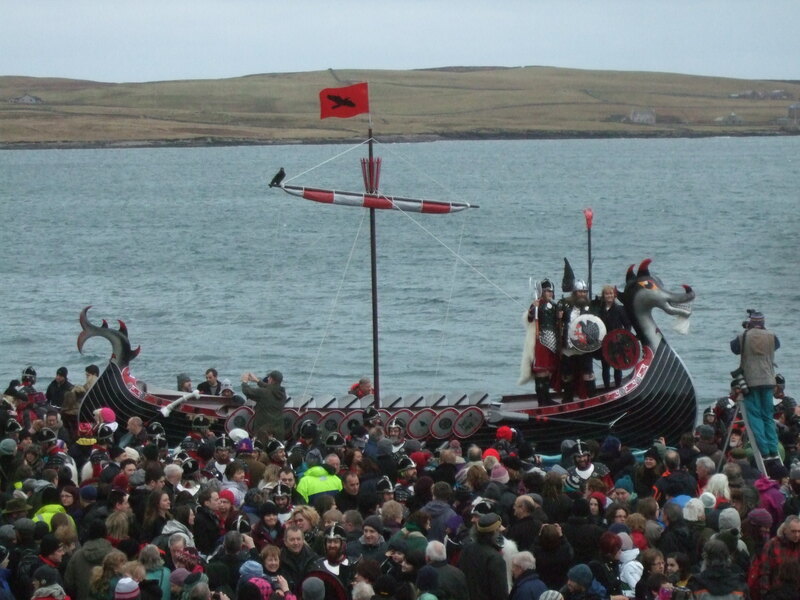 What most people don’t realise is that (a) this isn’t the only Up Helly A’ held in Shetland. 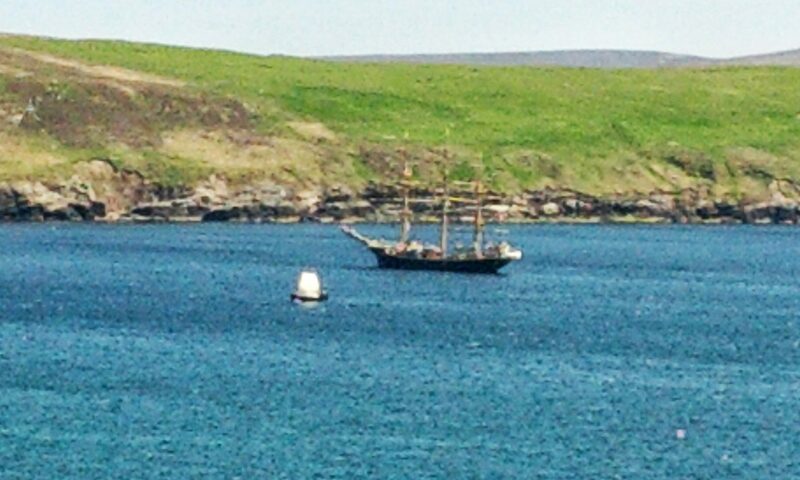 It’s the biggest, yes, but it’s only the Lerwick Up Helly A’. 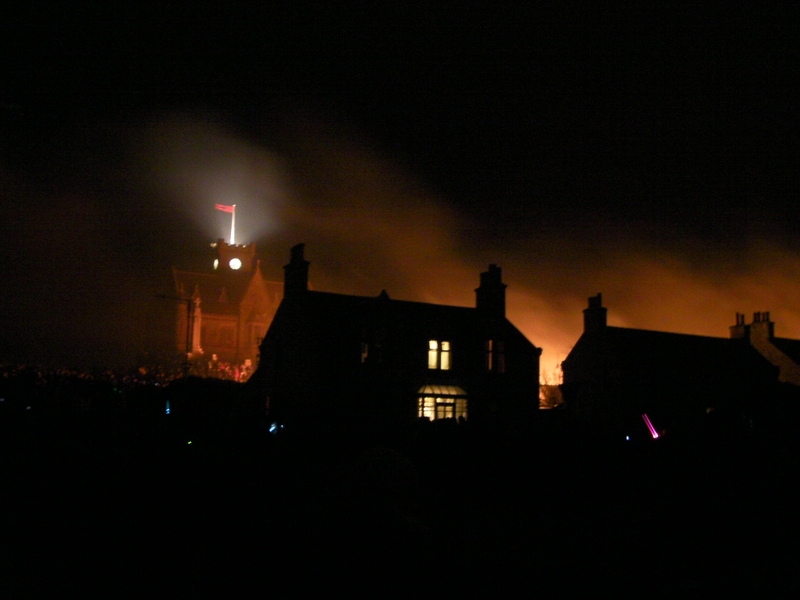 Others are held all around the islands beginning with Scalloway much earlier in January (where they push the boat out into the bay and burn it – as seen on Blue Peter) and finishing with the South Mainland Up Helly A’ (the newest) some time in March. (b) Not everyone dresses up as Vikings. Only the Jarl Squad (the head honcho for the year, big cheese, whatever you wish) gets to dress in these splendid, hand-crafted outfits. No Weta-Workshops clever plastic mail for these guys, it’s leather, metal, sheepskin, the real deal, and the workmanship is magnificent. Oh, but the others do get to dress up! Of the 963 “Guizers” this year, a paltry 57 were proper Vikings. 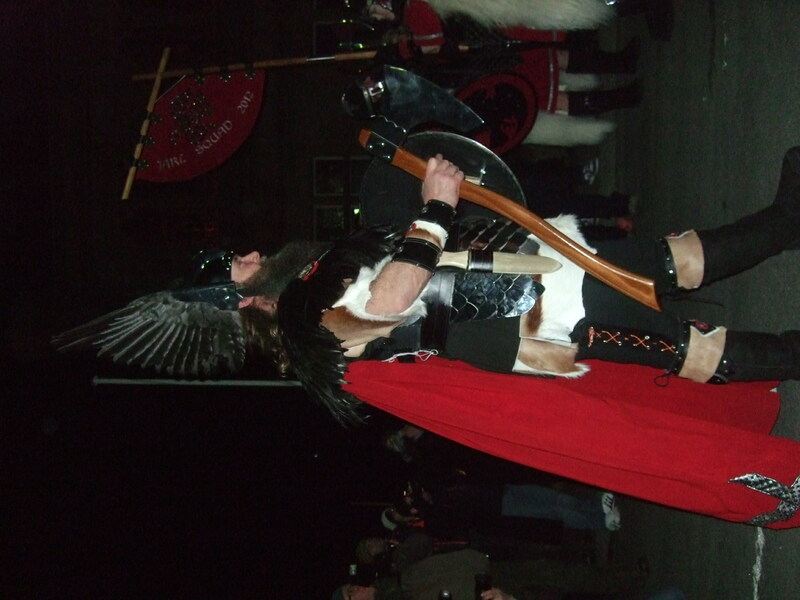 The other 906 were SWAT team members, Trows (Trolls), in drag of one form or another – it’s all men and men only for the Lerwick Up Helly A’, Bikers, pink rabbits (don’t ask), apes, Del Boy, Rodney, boxers… 47 squads and only 1 squad of Vikings. Events are held throughout the day. The Jarl Squad processes through the town to the dulcet tones of a brass band (playing the theme from the A-Team for some reason that no doubt makes sense to the Jarl), tourists and locals alike filling the streets to get a good close look at the outfits. All the shops have window displays of past Jarl Squad costumes, you can spend a happy few hours examining each in turn. They really are spectacular. As an aside, I saw the Weta exhibition one year at the Royal Armouries in Leeds. The level of detailing on these costumes exceeds that done for Theoden and Gimli’s costumes. There’s a Junior Squad as well, they do their full procession and boat-burning in the early evening. Then at half-seven, in the freezing streets, the signal goes up and the massed ranks light their torches. They then march through the streets, singing the Up Helly A’ song (it’s bound to be on You Tube but I’ve heard it so much these last few days I’ll let you find it yourself), finally gathering in the centre of town around the boat where they take months of workmanship, intricate craftsmanship, stunning carving, and burn it. There’s something incredibly powerful, primal about this. It’s one of the most spectacular things I’ve seen. Even more amazing is how few injuries there are and that we don’t have a specialist burns unit on-hand for when things go wrong. It’s incredibly well choreographed. And yes, that’s the kids playground in the front of that picture. It was still there when I passed today. 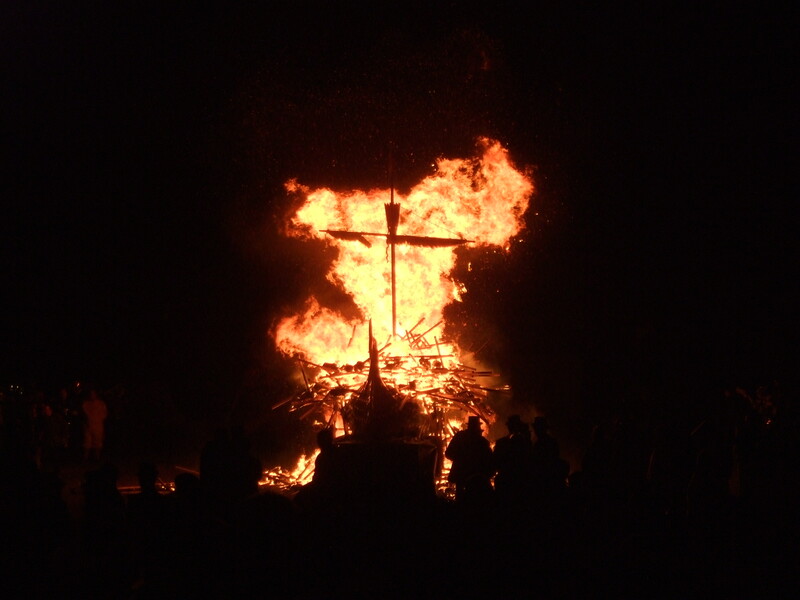 They save the figurehead before it’s consumed by the flames, the Jarl gets this. And that’s the end of the procession – but just the beginning of the celebrations… Y’see now everyone get the kids in bed and those that are off to one of the 11 Halls dotted around town get glammed up for a night of feasting, dancing and general entertainment. While the men dress up as Vikings (and other things), the ladies of the town have been very busy indeed. A squad of sharp-dressed men in black suits and hats, Madness-style, accompanied by the group Bombskare. These guys stayed and performed a couple of numbers for everyone – and I mean everyone – in the hall to dance to. Bombskare then went on to play a concert in Lerwick last night. I would’ve gone but I was, as they say at home, neither use to man nor beast. I’ll catch them next time they’re up here. And there was more! Much, much, more. Some of the acts were more cryptic in their meanings than others. The computer hacker was a news story from last year where the Met swooped in to arrest an alleged member of Anonymous without informing the Sheriff, Northern Constabulary or anyone else local – that was genius, they’d choreographed their routine brilliantly, danced it superbly and finished it off to the tune of The Bill with a lone Met Copper making the arrest. Think the “Cuban Pete” routine from “The Mask” where he’s got the police all dancing to his tune and you’re not far from the mark, only they hit half a dozen different pop videos during their number. Others weren’t so clear to me – in some respects I’ve still got an outsider’s eyes to local politics. When you did understand what a Squad was doing it was akin to solving a clue in the Times Cryptic Crossword. Anyway. 2 days later and I’m still feeling the effects. I’m tired, happy, and my coat still smells of the paraffin they use on the torches. Oh, and they start them young up here. The Jarl’s brother knows he’s going to be Guizer Jarl soon – 2019 to be precise. 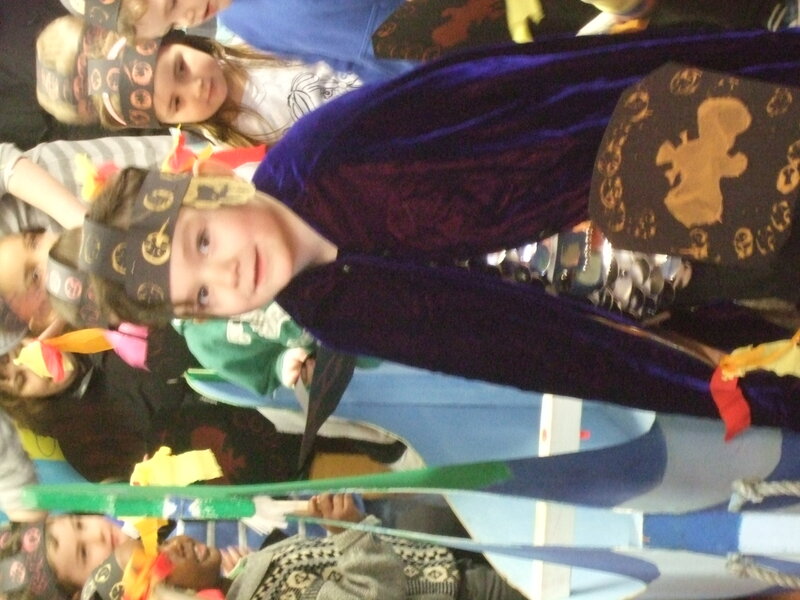 But all the schools and nurseries have their own little Up Helly A’s. Here’s my own Jarl. Well, that puts our new year fireworks into perspective. And we were in bed by half-past-twelve. Beginning to think I’m the one that needs the babysitter. The room’s there if you’re interested… It’s utter madness – but in a very good way.